Paul Revere's famous Boston Massacre engraving depicts the drama of this pivotal event in American history: nicely dressed British "Redcoats" fire their big guns at the backs of unarmed Colonists. So you'd expect the marker along Freedom Trail site commemorating this important event to be equally dramatic, right? After all, the clash between soldiers and Patriots on March 5, 1770 produced the first casualties in the fight for American liberty. Historians credit it (along with Paul Revere's engraving depicting it) with sparking the Revolutionary War. 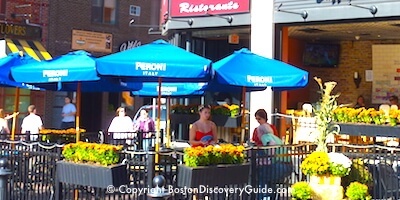 But you can easily miss the actual Boston Massacre site, unless you know exactly what to look for and where to look. And once you find the memorial, you'll probably say, "That's it?!?" The pavement-level memorial - a small star set within a circle of cobblestones under the East Balcony of the Old State House, roughly where the event took place - doesn't begin to convey the importance of that first major act of rebellion, almost 4 years before the famous Boston Tea Party. Nor does it capture the impact of the deaths of five Bostonians, the first casualties in the fight for American liberty. Paul Revere's engraving showing British troops firing at unarmed Colonials ... accurate depiction or propaganda? 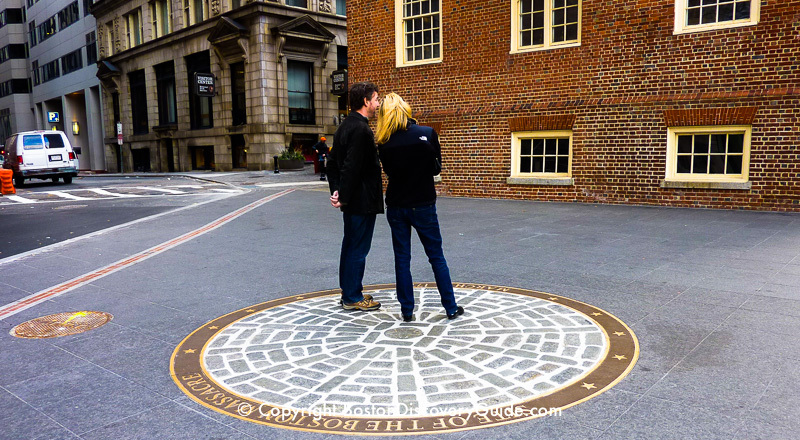 Why Visit the Boston Massacre Site? Quite frankly, if you just walk by, the Boston Massacre memorial itself is the least interesting Freedom Trail site, despite the importance of the event it commemorates. The marker gives you no sense of how the deaths of Colonists at this site marked a tipping point in attitudes toward the British. Even though relationships had become increasingly hostile through the decades, most Colonists did not advocate outright rebellion or independence...until the Massacre. Fortunately, you'll find plenty of tours, reenactments, and other Freedom Trail sites where you can get learn more about the Boston Massacre, its historical and social context, and its contributions to American liberty. 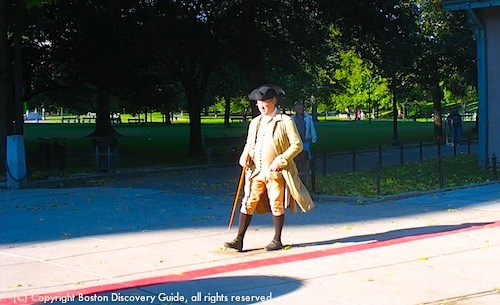 For making history come alive, the entertaining and highly knowledgeable guides who lead historical tours of Boston's Freedom Trail can't be beat! 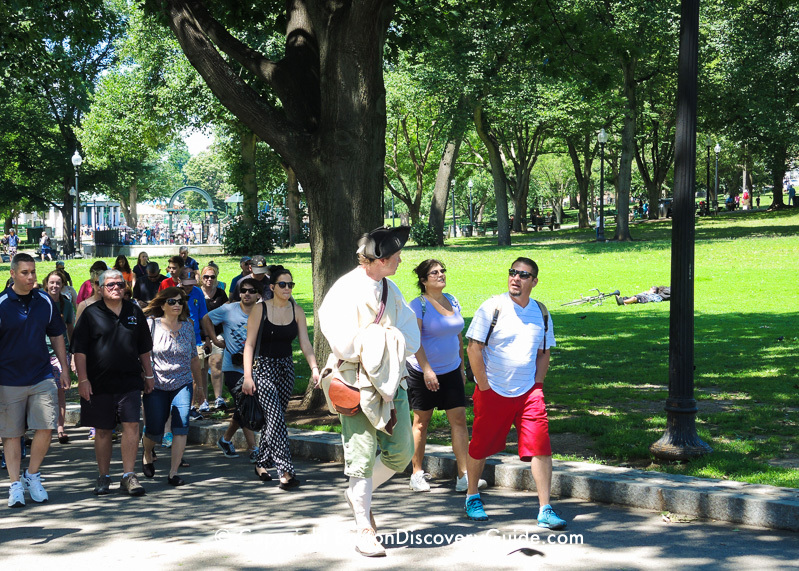 You'll visit the Boston Massacre site, Old Granary Burying Ground where the victims were buried, the Old State House where the confrontation took place, plus other Freedom Trail sites as part of these popular Boston walking tours. Each March, special reenactments bring the Boston Massacre to life for kids (and adults) at the Old State House Museum. Join Park Rangers as they lead young visitors in a reenactment of the deadly 1770 brawl between Colonists and Redcoats. Take part in reenacting the trial in which lawyers John Adams and John Quincy upholding the right to a fair trial and the rule of law as they defended the soldiers accused of murdering their fellow Bostonians. 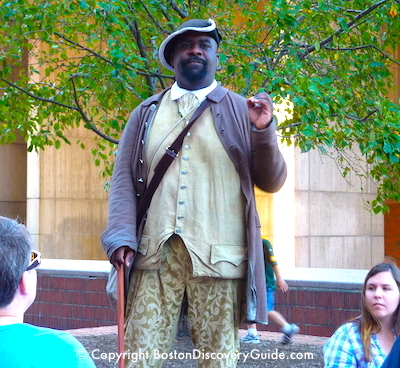 If you happen to see a reenactor playing the role of former slave Crispus Attucks near the Freedom Trail, stop and listen to his vivid account of events leading up to the Massacre. Attucks, of African and Native American ancestry, was the first person killed during the Massacre - the first to die for the cause of American liberty. 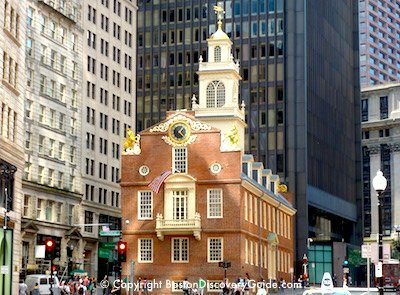 Visit the Old State House, scene of the the trial of the British soldiers and Boston's first reading of the Declaration of Independence in 1776. 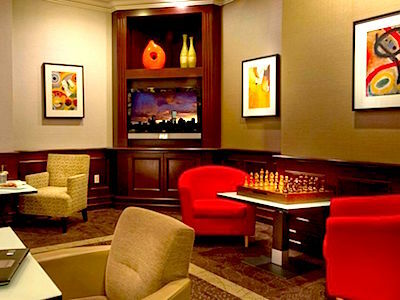 You'll even see tea from the Boston Tea Party in the museum! 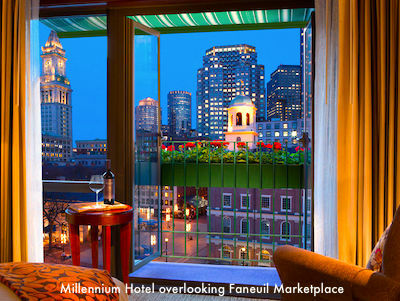 Free admission if you have a GoBoston Card. Want to know more about events leading up to the Revolution? Tour the Boston Tea Party Museum and Ships and immerse yourself in 18th century Boston among the authentically costumed guides and reenactors. 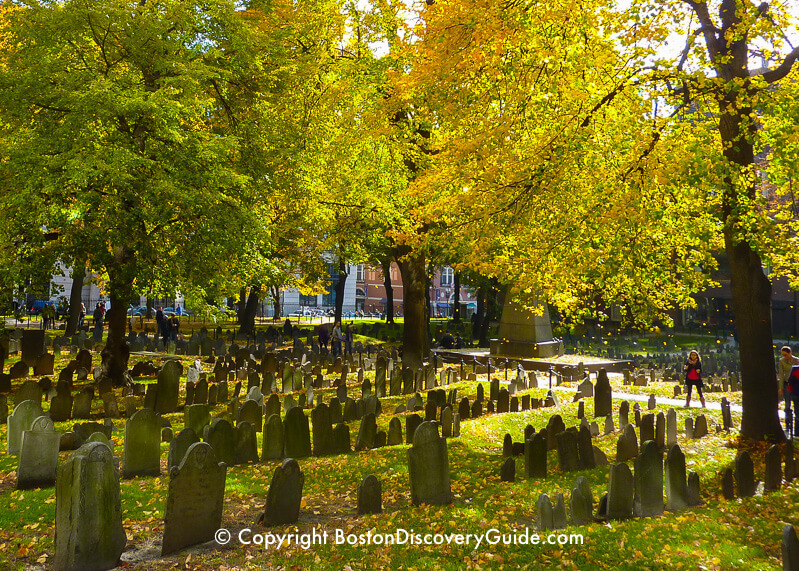 Visit Granary Burying Ground, final resting place of those killed in the Massacre, across from the Omni Parker House Hotel on School Street. Or go view the Boston Massacre Memorial, erected in 1888, near the Central Burying Ground in Boston Common. Paul Revere, whose Boston Massacre engraving filled the Colonists with rebellious passion, belonged to Sons of Liberty, a secret organization begun in the summer of 1765 when a group of 9 Boston shopkeepers and artisans dubbed "The Loyal Nine" began meeting secretly to protest England's Stamp Act taxes. Soon, the group began calling themselves the Sons of Liberty as over 2,000 others joined them. By 1766, Sons of Liberty existed in every colony. Revere created his famous engraving of the Massacre at the urging of his friend and fellow Son of Liberty, Samuel Adams, copying a drawing made by John Singleton Copley's stepbrother, Henry Pelham. 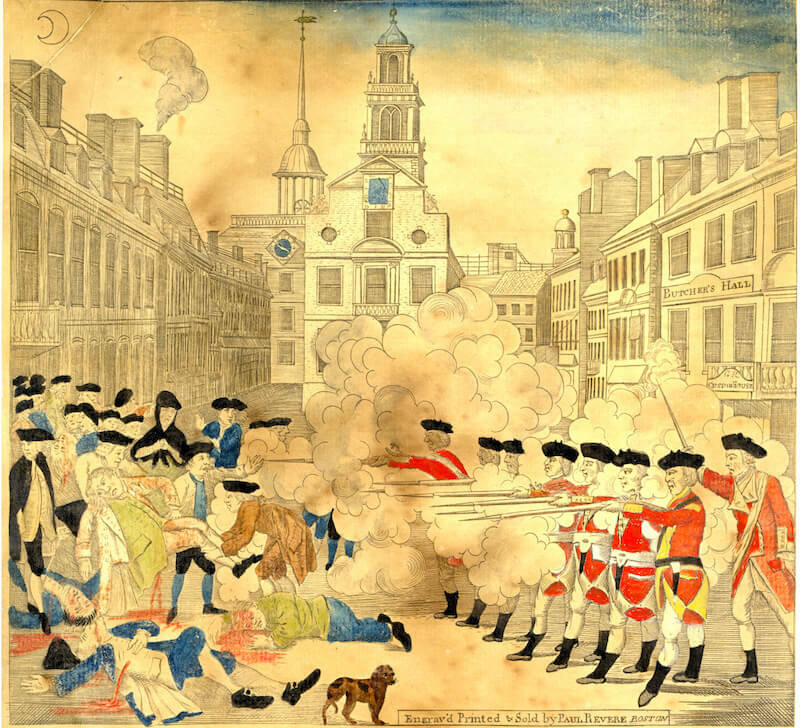 What Really Happened at the Boston Massacre? Snow and ice still covered the ground on the cold March day when the Massacre took place. Most historians agree that Revere's engraving showing carefully positioned British soldiers is wildly inaccurate - in fact, deliberately inflammatory. As a fervent Sons of Liberty member, Revere used his skills as an engraver to fan the sparks of revolution. It was the Sons of Liberty who first labeled the event a "massacre." Accounts in letters and journals written by observers describe an alcohol-fueled street brawl triggered by a quarrel over a dispute about a bill for a wig between a wigmaker's apprentice and a British officer. The young apprentice and his friends had just left one of the local taverns, looking for a fight. After exchanges of taunts from both sides, the officer - or possibly a different Redcoat - hit the boy with his musket and the crowd grew larger. More soldiers arrived. The crowd started throwing snowballs and stones at the soldiers and shouting, "Come out, you rascals, you bloody-backs, you lobster scoundrels - fire if you dare." Eye witness accounts differ as to what happened next. At some point, church bells started ringing and someone shouted "Fire!" Did the bells start ringing to warn of danger? Or did they ring later? Did someone shout "fire" because ringing the church bells typically signaled fire? Or did someone show "fire" as an order? By then, taunting had turned into a street brawl - so who could tell? The British soldiers fired their guns more or less point blank, despite being under orders not to shoot. Three people lay dead, two more died later from their injuries, and another six more were injured. Eyewitness accounts agree that Crispus Attucks, believed to be a merchant seaman/dockworker (and possibly a runaway slave) with an African-born dad and a Wampanoag (Native American) mom, was the first to die. If you look closely at Paul Revere's engraving of the Massacre near the top of this article, you'll see that all of the fallen appear to be white - another inaccuracy. This is corrected in the lesser-known Boston Massacre/Crispus Attucks Memorial on Boston Common near Tremont Street. Freedom Trail Location: East side of the Old State House at the corner of Washington and State Streets, Historic Downtown Boston.